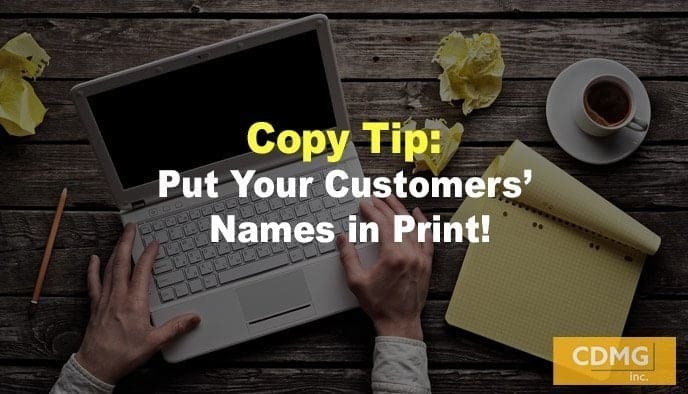 Copy Tip: Put Your Customers’ Names in Print! People love seeing their own name, and when you incorporate it in your copy, response rates go up. If you aren’t currently using personalization in your direct mail and email campaigns you may want to think about trying it in 2019. While response rates don’t always go up, they usually do. Here’s an easy idea: personalization. Personalization means designating certain spots within your copy where the recipient’s name will be placed automatically. The most powerful and effective use of personalization is, of course, in your own database. Try including your customer’s first name in regular communications you’re always sending, and you should experience a lift in response and relationship building. Prospects will subconsciously feel more of a connection with your message when you use their first name. It can even be in hand-written font. In a catalog or magalog, it’s not only possible to personalize both the front and back covers, but inside pages, too. This will keep the customer engaged 16 pages into your message. Note: When there is no name available, make sure your prospect receives a non-personalized default version. Make sure your data is correct—no misspellings! Only use a person’s real name when personalizing. A greeting to john389@gmail.com won’t cut it! Make it read naturally. Don’t force the personalization, or it will be counterproductive. Make your copy direct and personal – and profits will soar. Do you want help with your copy? Or do you want a direct marketing campaign that will make your sales soar? Call me at (310) 212-5727 or email Caleb at caleb@cdmginc.com for a free consultation. Copy Tip: What is your value proposition?